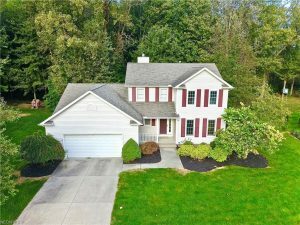 240 Mountainside Dr, Painesville Township Come see this beautifully-maintained 4-bedroom colonial on almost a half acre. The Great Room has a massive red-brick gas fireplace. A fabulous Master Bedroom suite has a glamour bathroom and walk-in closet. There is a first floor laundry room off of the main foyer. The large eat-in kitchen has plenty of cabinets and counter space, a nice-sized pantry, and a breakfast bar.